Steam the chicken in a steamer for an hour with some salt. Rest. Prepare the sauce by adding all the ingredients together and mix well. Have a separate dipping bowl for the soy sauce mixture and the Chilli Oil. 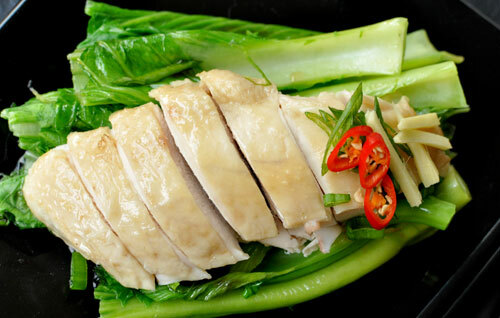 When the chicken has cooled down, cut the chicken into bite sized pieces with a sharp knife. Remove the breast area and be careful to maintain its shape and skin. Keep the stock that the steaming had produced, bring to the boil and blanch the ong choi or choi sum in the juices for about a minute. Place the chicken on the leaves and brush the skin with the remaining juices of the chicken. Serve with Steamed Rice or Chicken Stock Rice.